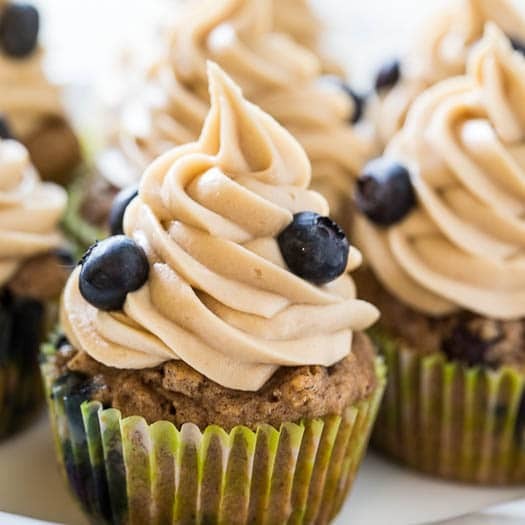 These Blueberry Maple Cupcakes are the cupcake equivalent of blueberry pancakes. Topped with a creamy frosting that tastes just like maple syrup. Birthdays (and Blogiversaries) always call for cake or cupcakes to celebrate. 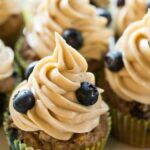 These Blueberry Maple Cupcakes are extra special and unique. They taste like the cupcake version of blueberry pancakes. 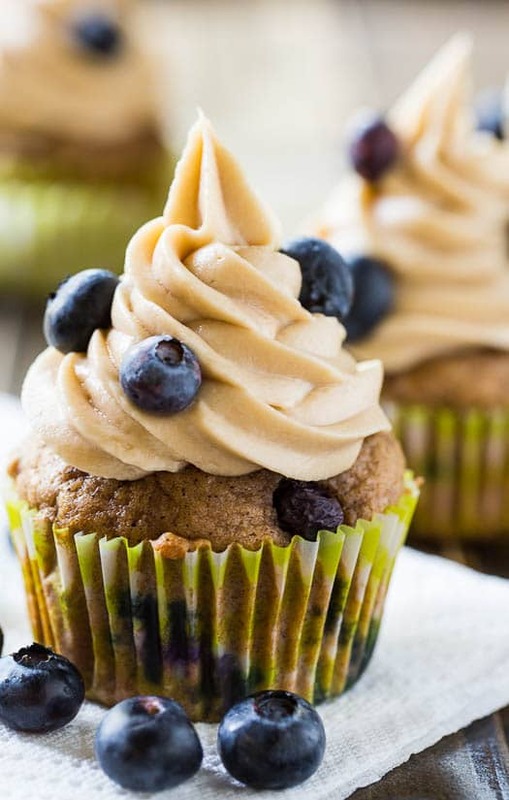 The texture of the cupcake is a little more like a muffin than a cupcakes and it’s filled with beautiful, sweet blueberries. The frosting is to die for. Definitely one of my favorite frosting recipes. I like to really pile it on the cupcakes. It has the perfect texture- creamy, thick, and smooth, plus an incredible maple syrup flavor from some maple flavoring. If you don’t have maple flavoring, you will not regret purchasing some for this recipe. You could probably sub pure maple syrup but you will not get the intense maple flavor. 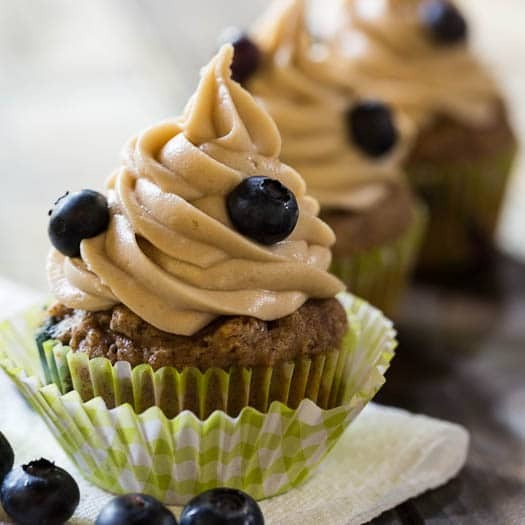 These Blueberry Maple Cupcakes taste like the cupcake equivalent of blueberry pancakes! Preheat oven to 350 degrees and line muffin pans with liners (12). Using mixer fitted with a paddle attachment beat butter and sugar until fluffy. On low-speed add eggs and egg white and beat until fully mixed in. Mix sour cream, milk, and vanilla together. Add 1/3 of dry ingredients to mixer, then 1/2 of wet. Followed by another 1/3 of dry. Finish with remaining wet and dry ingredients. Careful not to overmix. Fold in blueberries and fill muffin liners 3/4 full. Bake 18-20 minutes or until very tops are fully cooked. To make frosting, beat butter and cream cheese until fluffy. Add maple flavoring and sugar and beat until smooth. Cool cupcakes before frosting. Use a pastry bag fitted with a large star and swirl around the outer part of cupcake and gradually come inwards with each swirl. Or just slather it on there. This entry was posted in Cakes, Desserts and tagged blueberries, cupcakes. Bookmark the permalink. You should submit this to Alpine Fresh’s recipe contest. This is a winner for sure!!! 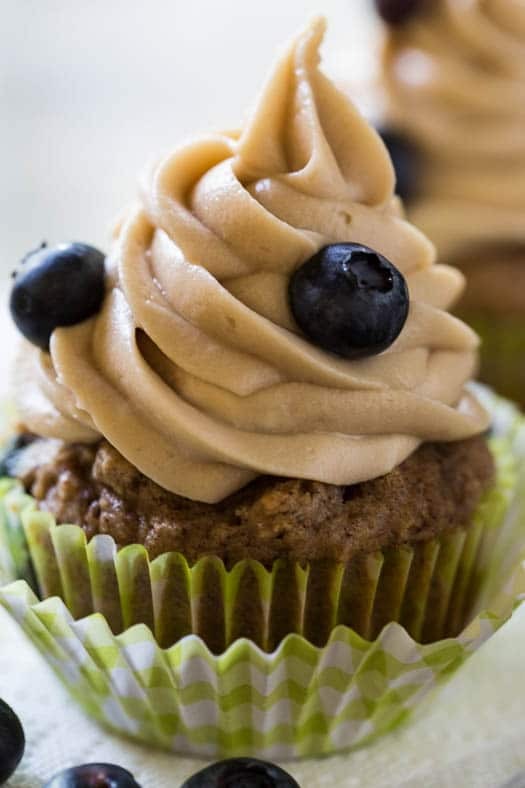 Pingback: Blueberry Maple Cupcakes - Cupcake Daily Blog - Best Cupcake Recipes .. one happy bite at a time! I am making your bbq pulled pork spaghetti tonight!! Looks so good! PS. Those cupcakes look delicious!! Thank you Kelly! I hope you enjoy the bbq spaghetti! 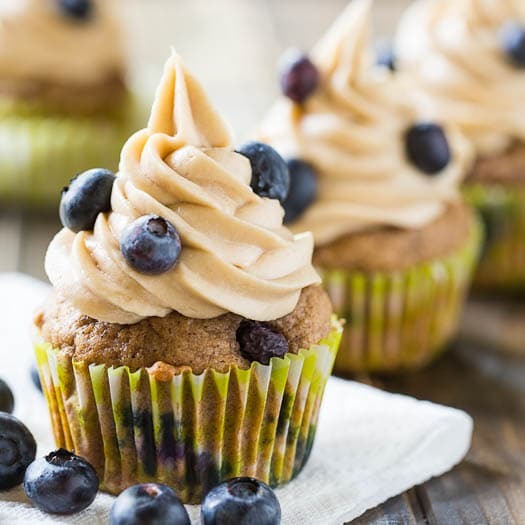 My son loves blueberries, so I have to try these cupcakes – next I would love to try the red white and blue fruit salad. I’d like to try the Chocolate Heart of Darkness Cakes. I’m going to close my eyes and dream of these cupcakes! In love with the taste of blueberry and maple! YUM! I would love to make these delicious cupcakes…gorgeous! The cupcakes are next on my to make list! These cupcakes have my mouth watering. Amazing! Pinned! They look so happy and handsome! Wonderful muffins! Wow gorgeous cupcakes! I just love maple anything. Perfectly frosted too! I am loving these cupcakes!!! And that you are so adorably sweet to co-host a giveaway for Melanie’s Blogiversary! 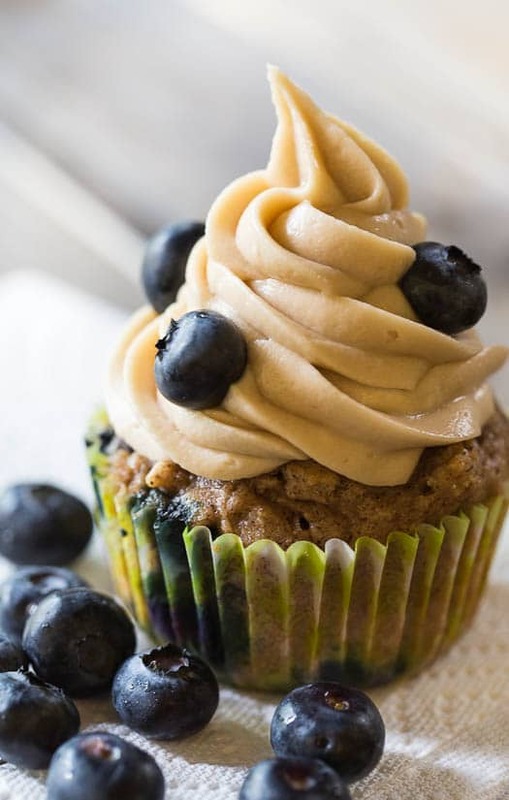 I feel like since there are blueberries and maple these cupcakes almost count as an acceptable breakfast! I am plan on trying the red velvet cake, it looks wonderful! I would love to try the blueberry coconut sparkler! I just fried up a package of maple bacon yesterday. I wonder how some crumbles of that would taste in the frosting. I’m going to have to try that. These look gorgeous in the photos! Your recipes here are delish! Thk you for this giveaway too! 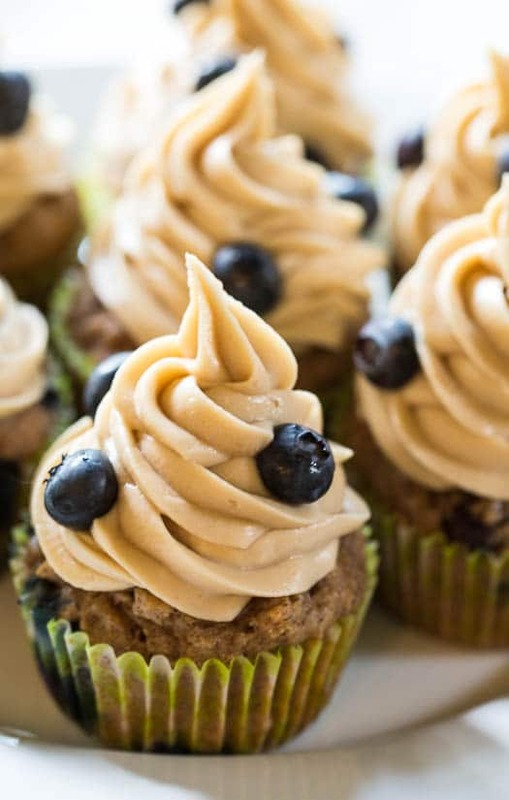 The blueberry maple cupcakes look delish! I really want to try your Pumpkin-White Chocolate Chip Cookies. Perfect for breakfast. 😉 Thanks for the giveaway too! How much fun! And what a great giveaway! I definitely plan on trying these cupcakes! You sold me with the picture. The frosting tops are so jaunty with the blueberries nestled in it’s folds. Sweet. Nice mix of spices for the cake part. i’d like one for breakfast! We go blueberry picking every summer. I’ll put this on the list of things to make with my haul! This recipe looks great, I would love to try it out. These cupcakes are too cute and I love the flavors you used!! A cupcake that tastes like blueberry pancakes!? So cool! I love the idea of blueberry and maple! Nothing better than blueberry pancakes with maple syrup, so I bet these taste amazing! Love all the frosting you put on them. Have a great weekend! What beautiful cupcakes, Christin! 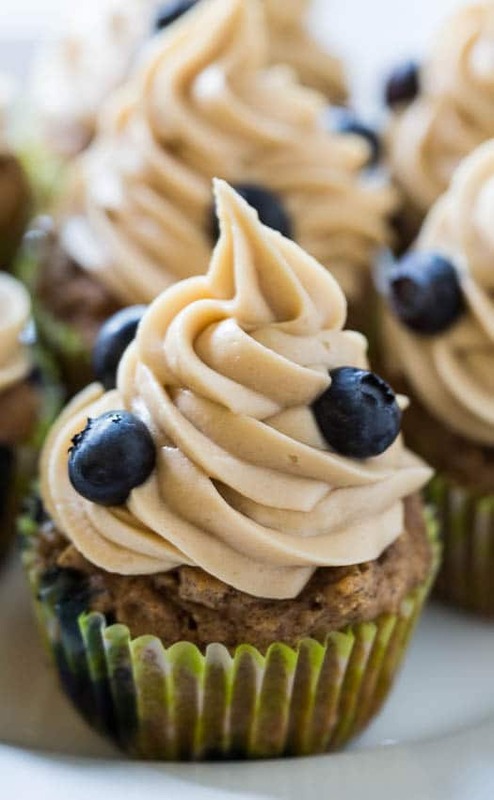 Adding maple in these is a brilliant idea…definitely sets these apart from regular ‘ole cupcakes. Pinned! I plan on trying your Southern Style green beans…love bacon!